Im am looking for new headphones and I LOVE Anker. But have a few questions, and just found this forum that I didn't know existed! My biggest question is, Can you just always have the noise cancellation off and if you have it off how much noise can you hear? I love everything about the Life 2 headphones that I have seen so far and they have everything that I want but not sure if I am going to be a huge fan of the ANC because I like to be aware of my surroundings, especially when I start going back to college. I really like the Sony headphones that I have tried in the store but they are expensive and I have heard the customer support is not great. I have a pair of the NB10 Soundbuds sports and love them and trust Anker and their quality and support if I have any issues so much better. PLUS THE PRICE! I know Anker has other Bluetooth over the ear headphones like this that don't have Noise Canceling but the ear cups seem a lot smaller and that is the main reason I am looking for a new pair of headphones. Thanks for any answers. I think i may have a few more questions but not sure what right now haha. Great review and I'm really happy your son approves them. That is the true testament of the quality of these headphones. Hopefully this helps some. I'm pretty sure the cable has a mic built into it. I'll double check when I get home from work tonight. You can choose to have noise-cancelling turned off. It remembers the last setting. The headphones do a pretty decent job blocking out external sound, so they still sound great with noise-cancelling turned off and it's difficult to hear what's happening around you when audio is playing. Yes the Bose's price is not very convenient for customers! 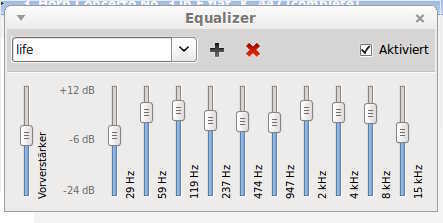 Use an equalizer with 10 adjustable frequencies. This way you might create really the "sound" you like. And if there is a adjustable preamp ("Vorverstärker" at the photo) -> Always "minus"! I raised the "middles" as well just a little, for me seems to be better. Does the cable that comes with it have a microphone in it? Yes, yes it does have a built in mic. On the basis, the inline controller has a small hole in it? Yes. You can turn it off, but you (well I did) notice a drop in sound volume of the music playing, as you are no longer isolated. I'm half deaf, litterally, when I have anc turned off, I felt it did subdue the outside sound, but that's down to having large ear muffs covering g your ears. Obvs it's not the scale of active noise cancellation, but it does remove by design outside noise. It's often referred to as PASSIVE noise cancelling, as apposed to when using the built in ACTIVE noise cancelling. ANC in this case, is a little white noise, like a very subtle hiss, this turned on, not only removes sound from outside the headphones, but also as a side note,.improves the listening experience with the sound inside becoming clearer and louder (to a certain degree). This is the effect of ANC, isolating you. Fighter pilots have white noise played when flying, so they can hear ground.control n each other some much more clearly, and considering the noise of the jet/turbine engine, it's bloody good. According to the book, they last 30hrs in nluetoothode and ANC (I'm.guessing longer if no ANC).big in wired ANC mode you get 60hrs of listening.... With ANC off n wired mode, you can listen as long as you like as no energy is being used. That's a great application for the ANC technology! I hadn't event hought of that. As a teacher I've had to find accommodations for various kids with spectrum or SPD issues. I had never thought of how useful ANC could be for this! Also, great review -- thanks! Great review! I appreciate you sharing your story with us. It's in stories like yours that make me happy to gadget-obsessed. Finding use in our lives, the things we have can make our situations better and we can live a bit better with these tools at our side. I'm happy you found a unique use for the noise cancellation and that it's brought relief to your life and something new to share with your child! Anker is providing life-changing tech in an affordable package. Everyone wins! I've been to those, it's a really weird feeling!! You need good headphones for the better experience though.